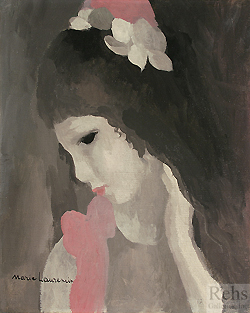 Marie Laurencin’s name is inextricably linked with the avant-garde art of Paris in the first half of the twentieth century. Her involvement with the early years of ubism is legendary, and yet her style was independent of the analytical experiments of Bracque and Picasso. Like many of her colleagues, Laurencin started her artistic career modestly—in her case at the Académie Humbert in Paris in 1903 at age 20. Her intention was to become a porcelain painter, but a fellow student encouraged her to think more broadly. That student was Georges Bracque, and he soon introduced her to Pablo Picasso and the group of artists, writers, poets and musicians who frequented the bateau-lavoir, the scruffy Montmartre apartment building that Picasso and Max Jacob called home. It was through her friendship with Picasso that she met the poet and art critic, Guillaume Apollinaire who would become her lover for the next six years. Apollinarie not only promoted Laurencin’s painting in the press, but he encouraged her to experiment in a variety of media. Two versions of Apollinaire and His Friends date from this period. In the first version, Laurencin shows Apollinaire in the center of the painting, surrounded by Picasso, Fernande Olivier (Picasso’s lover at the time), Laurencin herself, and Picasso’s dog, Fricka. The American writer and art collector, Gertrude Stein purchased the painting immediately, and thus prompted Laurencin to paint a second version that included both Stein as well as several other friends. Apollinaire kept the second version for himself. During the years leading up to World War I, Laurencin was deeply involved with the community of artists devoted to experimental work. She first exhibited her work at the Salon des Indépendants in 1907, and then again in 1910 and 1911 where her paintings were hung with the Cubists. In 1912, she was part of the Section d’or exhibition at the Galerie Boëtie along with Fernand Leger, Marcel Duchamp, Raymond Duchamp-Villon, Juan Gris, Francis Picabia, Robert Delaunay, André Lhote and Louis Marcoussis; that same year she and Robert Delaunay had a joint show at the Galerie Barbazanges. She also collaborated on the Maison Cubiste with Duchamp-Villon and André Mare. Only photographs of this experiment in interior design survive, but it clearly expressed the concept of a totally designed home in which all elements were created to form an integrated whole. It also represented one of Laurencin’s earliest forays into design, a field in which she would later develop considerable expertise. Following on these critically—if not always financially—successful activities, Laurencin’s work was also part of the infamous 1913 Armory Show in New York, in which Americans were introduced to undiluted French modernism. As the geopolitical crisis in Europe deepened, Laurencin’s personal life with Apollinarie also reached a defining moment; unwilling to continue tolerating his philandering, she ended the affair in 1912. Reportedly, Apollinaire remained unconvinced that she was serious until 1914, when she married Otto von Waëtgen, a painter whom she had met at the Académie Humbert some years earlier. The war forced the newly married couple into exile in Spain where von Waëtgen’s German status was less problematic, but life there was a constant struggle to make ends meet and, increasingly, to keep von Waëtgen sober. Although Laurencin met up with friends from Paris, including Picabia who published several of her poems in his new Dada magazine, 391, she later recalled this period of her life as particularly bleak. Once the war ended, she was able to move to Dusseldorf, von Waëtgen’s hometown, where she settled until the Treaty of Versailles was signed on 10 January 1920; because she was married to a German national, she was not allowed to return to France until hostilities were legally ended with the signing of the treaty. Meanwhile, she had filed for divorce in Dusseldorf, and had again begun to focus attention on her art. Returning to Paris in 1920, Laurencin established a business relationship with the art dealer, Paul Rosenberg, who handled her financial expenses in exchange for a large commission on her works. This arrangement seems to have suited Laurencin quite well; she no longer had to worry about financial pressures, and she was able to pursue her art with relative freedom. Rosenberg’s gallery did well during the 1920s and 1930s; and he was wise enough to open a gallery in London in 1935, and another in New York in 1940 as Hitler’s power expanded. Paris in the Jazz Age was an intoxicating place for the arts, and Laurencin’s imagery captures that moment perfectly. Like so many artists, she worked comfortably in many media, including book illustrations, set design, costume design, interior design, and lithography in addition to painting. During these years, she also began accepting portrait commissions, most famously the 1923 Portrait of Coco Chanel, which the couturier rejected. Her career as a book illustrator began in 1919 with what was essentially a favor for her friend Louise Faure-Favier, who requested images for her new book, Les Choses qui seront vieilles (1919). For Laurencin, this project opened up a new horizon that would provide diverse outlets for her images for decades to come. The best known of these books are Alice in Wonderland (1930); Katherine Mansfield’s Garden Party (1939); and Paul Verlaine’s Fêtes galantes (1944). The 1920s also brought Laurencin into the world of modern ballet. Although she was familiar with Serge Diaghilev’s Ballet Russe productions before World War I, it was not until 1923 that she began designing sets and costumes for a new ballet, composed by Francis Poulenc—Les Biches. The story followed a group of fashionable women and men at a house party, languishing in their flowing costumes as they bemoaned their tedious—but very stylish—existence amid sophisticated interior spaces. The ballet was the hit of the season with both the public and the critics. Over the next three years, it traveled to Monte Carlo, London and Berlin with Laurencin’s sets and costumes; in 1964, Covent Garden successfully revived it with the same designs. The triumph of Les Biches led to other stage work for Laurencin, Including Les Roses for the Soirées de Paris Ballet by Etienne Beaumont; L’Eventail de Jeanne in 1927; and Á Quoi rêvent les jeunes filles?, a revival of Alfred de Musset’s play at the Comédie Française in 1928. Her skill at designing costumes that allowed freedom of movement was paramount in these projects as well as her ability to suggest ambience with minimal effects---in short, her refined understanding of how the theatre creates a convincing illusion. Related to this work was her collaboration on the interiors for the Ambassade Française at the 1925 Exposition des arts décoratifs et industrielles modernes, the world’s first international exposition after the end of World War I, perhaps best recognized for having engendered the term “art deco”. Together with other designers from the Société des artistes décorateurs, Laurencin was invited to participate by Andre Groult, the husband of her good friend, Nicole. Her contribution to the project was a set of paintings for the “boudoir of Madame Ambassador”—yet another example of the “modern woman” of Jazz Age Paris. Laurencin was fortunate to have consistent work throughout her long career. She painted consistently and Rosenberg exhibited her work in both Paris and London until anti-Semitism forced him to leave Europe in 1940. World War Ii brought new commissions to a halt, but Laurencin seems to have managed to stay in Paris without extreme hardship. At the war’s end in 1945, at age 62, she took up where she left off, creating a stage design for a new ballet, Le Déjeuner sur l’herbe. In spite of declining sale prices in the years immediately preceding the war, Laurencin’s reputation rose dramatically in the late 1940s. Her paintings in particular were increasingly desirable, and her graphic work gradually emerged as a significant portion of her overall oeuvre. As always, she maintained her lifelong friendships and her enthusiasm for life. 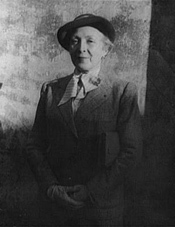 In a biographical memoir of Marie Laurencin, Flora Groult, the daughter of Nicole and André Groult, recalls that her mother had a delightful lunch with Laurencin on 7 June 1956. On 8 June, she was dead of a sudden heart attack. Laurencin was buried in Père Lachaise cemetery—per her instructions—in a white dress with a rose in her hand and Apollinaire’s letters on her heart. [i]. [i] Flora Groult, Marie Laurencin, (Paris: Mercure de France, 1987), 280.